Duke Nukem is a parody and Bulletstorm isn't, says People Can Fly creative director Adrian Chmielarz. You'd be forgiven for thinking that Polish developer People Can Fly had learnt a few tricks from Duke Nukem when it was putting together its over the top, sci-fi shooter Bulletstorm, but Chmielarz says that the similarities are coincidental, and that Bulletstorm is cut from whole cloth. Chmielarz said that he'd dabbled in Duke Nukem, but had never played any significant amount of the games, rarely getting any further than the first chapter. He thought that at the time - around 1996 - he wasn't familiar enough with American pop culture to be able to appreciate the game properly. He wasn't surprised that people were making comparisons between the two games, as humorous, sci-fi shooters were thin on the ground, but thought that the one-liners and humor served a different purpose in Bulletstorm than in Duke Nukem. "I might be wrong," he said, "but I believe Duke was always more of a parody than a real story, and while our one-liners and "over the topness" are icing on the cake, for Duke it is the cake." 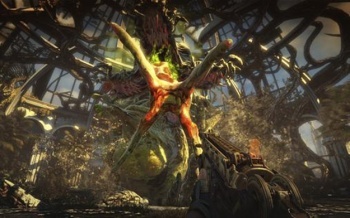 Duke Nukem might not have had much influence on Bulletstorm, but Chmielarz said that Epic's design director Cliff Bleszinski, better known as CliffyB, had been an integral part of the development process. "Cliff - and a lot of other guys from Epic - have huge influence on the game," he said. "That's their modus operandi; [Epic] worked very long and very hard to become one of the most respected and successful developers in the world and they'd never attach their name to anything that is not up to their ridiculously high standards." Bulletstorm will be released for PC, PS3 and Xbox 360 in February 2011.